Lorsch in Germany hosts the European Championships this weekend with the junior, Under-23 and elite women's races on Saturday. Cyclocrossrider editor Konrad Manning also joins the hundreds of Masters racing their European age-group championships. 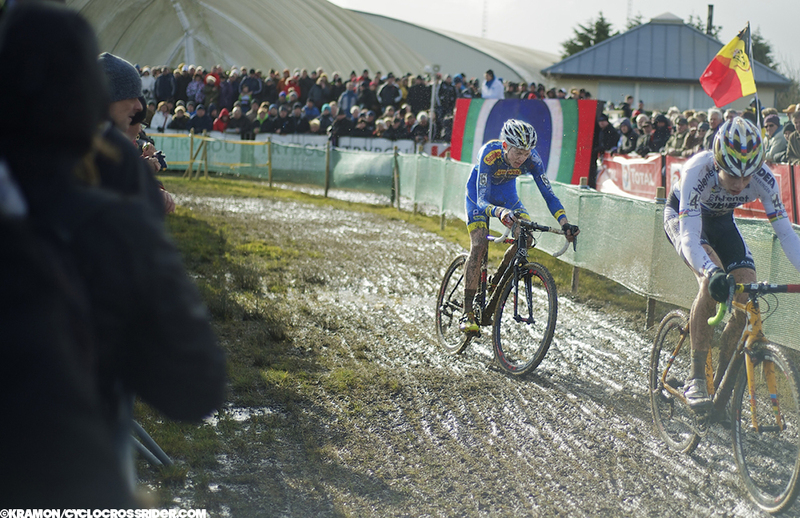 On Sunday there is more thrilling Superprestige action with round three from Ruddervoorde, so stay tuned. HELEN WYMAN defends her European title in Lorsch, Germany on Saturday (November 8th) against 19 other women including six riders from the World’s top ten. British champion Wyman, who has won the Euro title for the past two seasons, had a look at the flattish, flood plain course on Friday and conditions are understood to be dry with no rain forecast. “Still not got that mud yet this season then,” tweeted Wyman. The rider perhaps most likely to dethrone Wyman is in-form Dutchwoman Sophie De Boer who won the Koppenbergcross last weekend. Other likely challengers include fellow-Brit Nikki Harris and the Belgian trio of Sanne Cant, Ellen Van Loy and Jolien Verschueren. World Under-23 champion Wout Van Aert goes into the Europeans with a double win behind him last weekend and, without Mathieu Van der Poel, his toughest opponent will be defending champion Michael Vanthourenhout. Belgium send a formidable team of nine riders: Van Aert, Vanthourenhout, the Sweeck brothers, Toon Aerts, Quinten Hermans, Yannick Peeters, Daan Soete and Jens Vandekinderen. Van der Poel has decided to give the race a miss with there being an elite Superprestige race in Ruddervoorde on Sunday (see below). The French could also spring a surprise podium finisher with either Clement Venturini (a winner in the Swiss EKZ CrossTour last weekend) or Fabien Doubey (third in the Valkenburg World Cup). Belgian champion Eli Iserbyt will be difficult to beat in the Junior men’s race in a competitive field of 86 starters. In the Under-23 women’s race Sabrina Stultiens will be hoping to keep the title in Dutch hands under sad circumstances – last year’s champion Annefleur Kalvenhaar was tragically killed in a mountain bike race this summer. Cyclocrossrider editor Konrad Manning will be in Lorsch and racing himself in the European Masters championships on Sunday (with no grand expectations – Ed). A category for Elite men is expected to be added next season for the first time since the championships started in 2003. Race times: 10.15 Junior men; 11.15 Under-23 women; 13.00 Under-23 men; 14.10 Elite women. We do not expect any live coverage from Lorsch. Reigning European champion Michael Vanthourenhout chases World Under-23 champion Wout Van Aert. The elite men, after last weekend’s big double-header, will largely wait until Sunday to race the third round of the Superprestige across the farmland surrounding the village of Ruddervoorde in West Flanders. The Jaarmarktcross in Niel also comes up quickly afterwards on Tuesday evening. Klaas Vantornout was the winner twelve months ago and the flat and fast farmland will also suit his team mate Kevin Pauwels (above left) – the winner last weekend in Zonhoven. Mathieu Van der Poel is also expected to start against joint-series leaders Sven Nys and Lars Van der Haar. Nys – with only three UCI wins this season - cannot be discounted, of course, on what will be a dry parcours – the Belgian champion has won in Ruddervoorde a record TEN times. Live TV coverage will begin just prior to the elite men’s race around 14.45 (CET) via Vier. Result: 1 Vantornout; 2 Nys; 3 Meeusen. Laatste ronde: here.